Written by Matty Cohen on October 24, 2013 Blog, Product news. 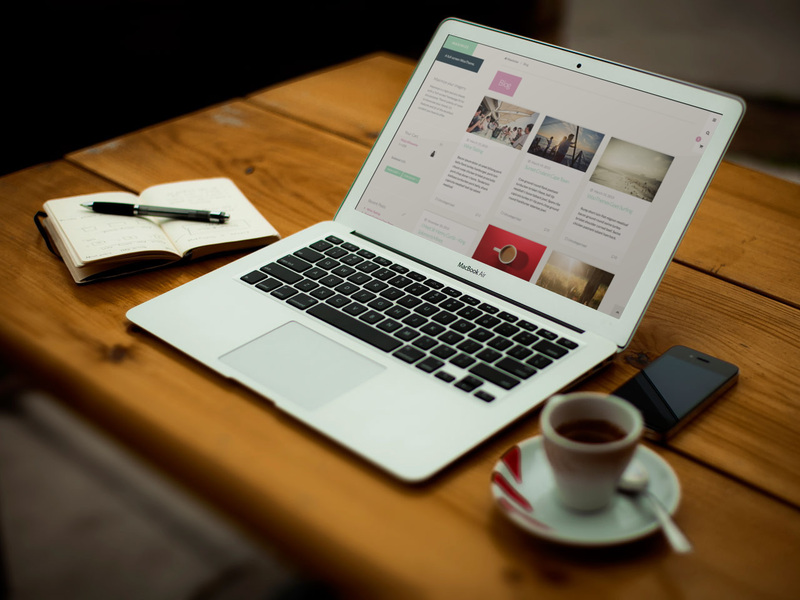 For us at Woo, we’re all loyal WordPress users, as well as developers and designers. We love creating and sharing content, as much as we love WordPress and our various design, development and technical support roles. In addition to being loyal to the WordPress cause, our team members enjoy photography and sharing images, be it on Instagram or via a high-end SLR camera. With this in mind, we’d like to introduce you to Maximize, a theme aimed at showcasing your images. The goals set out for Maximize are present in it’s very name; maximize your imagery. To this end, the theme’s homepage places it’s main emphasis on showcasing your imagery, first and foremost, without forgetting about the text content accompanying your imagery. Maximize strikes a carefully crafted balance between photography, showcasing your emotion behind the image, and the text content, for providing the context. Designed by our very own James Koster, Maximize can be shaped and crafted as desired with a few small tweaks in a child theme, or using the in-built theme styling options. 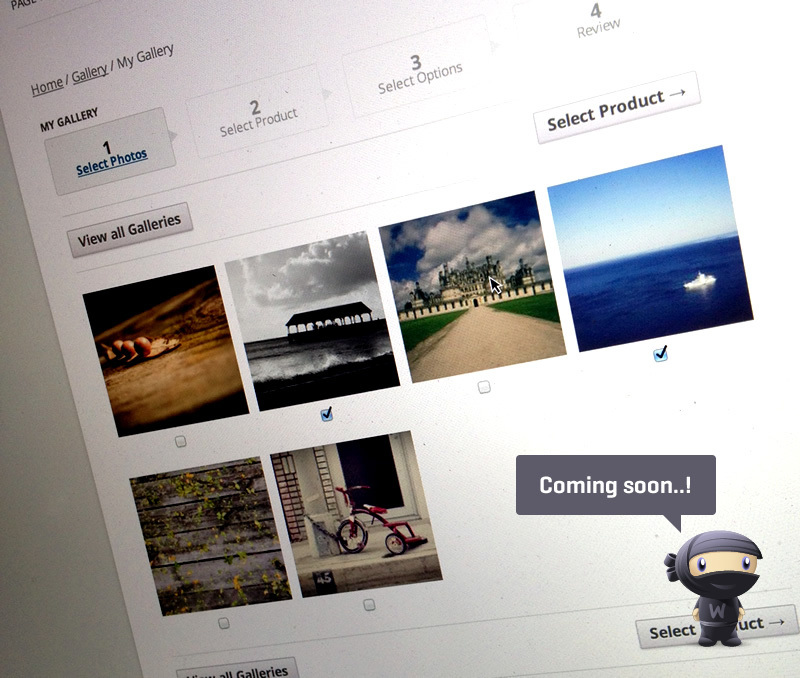 Alongside Maximize, we’d like to provide a sneak preview of a WooCommerce extension we’ve been working on, aimed at photographers. This extension takes Maximize to a new level, enabling the collection, selection and sale of your photographs in collections and with various customisations and settings applied (dimensions, etc). If you’re a professional photographer and wish to sell your prints, look no further than the WooCommerce Photography extension. This extension is estimated to be launched towards the end of Q2 2014. Please stay tuned to our blog for updates as soon as we have them. While Maximize is primarily aimed at photographers, the theme can be used for anything from a standard blog-style layout to a website showcasing your company’s range of high quality products. With styling support for our Features and Testimonials plugins, as well as a “Business” page template, your own design is just a few small tweaks away in the “Theme Options” section. As long as you have great and personally passionate imagery, Maximize is the theme for you. To illustrate this, we’ve set up a demo website to showcase Maximize and to show off some wonderful imagery at the same time. Customising your copy of “Maximize” to meet your desires is important to us. With this in mind, no expense has been spared to ensure ease of use and customisation of the theme with a few clicks and your custom eye-catching imagery. Quickly provide a unique feel on your website, using our tailored selection of customisation options. A few simple clicks, your logo and your branding colours can transform Maximize into your very own, uniquely-branded, website. Grab this theme with a 13% discount coupon, valid until 31st October, 2013. Just use MAXIMIZE13 as your coupon code on checkout. 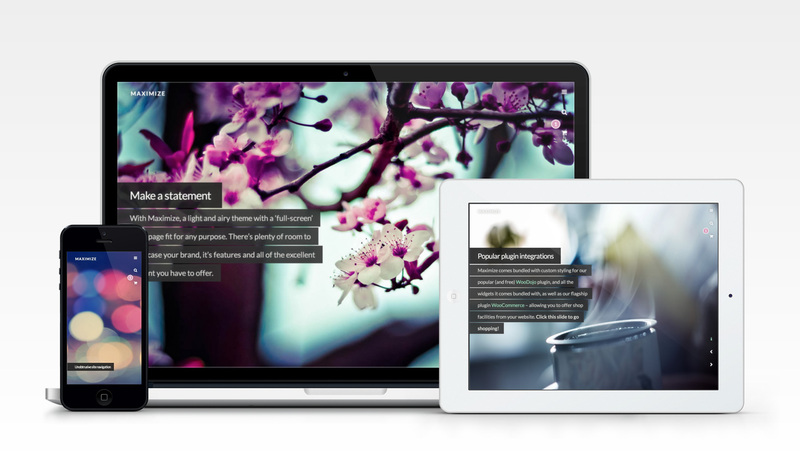 Finally, a innovate, exciting and amazing theme from Woothemes. Since The One Pager Woothemes not releasead something amazing!! I couldn’t submit ticket because theme doesn’t appear yet, but, how to hide title pages? In this case, in Blog page. Maximize should now be an option in the support ticket submission form. Please submit your query there. Thanks! Really, this is an innovate theme, finally… you really make an effort on this… is really awesome, every detail is different, very well designed, and orginal, but also, clear and useful, one of your best themes ever… really, congratulations! This is gorgeous. Yay Woothemes cutting edge design is back. Love the detailing and the flat design. One of the best themes you’ve done… nice work. I noticed that the homepage audio kept playing, after I moved to another slider..
I’ll create an issue and see if we can solve that issue. It will be compatible with sensei? Is it possible to make the theme responsive for android tablets? The theme is responsive out the box with any device (responsiveness is based on screen size irrespective of what device is being used). If you are having specific issues with the the theme not being responsive then please log a support ticket so we can get it sorted out! Just to add to this, if you are viewing the theme in the theme demo switcher that may cause responsive issues. Finally something innovative and different. Bravo! This is something I was looking and hoping for you. WooThemes makes themes with the world’s best functionalities and ease of use, but when it comes to the design part, it’s simple outdated, boring and in fact pretty stale. Now here, this themes, is the big change I was waiting for. So now you go from Functionality+Bad Design to Functionality+Good Design. I just hope you keep making such modern looking themes, because this is the kind of quality people are expecting from a million dollar company like you. I many times use to look at all those amazing crazy WordPress themes on Themeforest.net and use to feel bad that wish, either they had the same functionality that WooThemes had or either WooThemes made such beautiful themes. I hope things will change for me now. I am really hope for a theme from you that makes use of modern transitions and paralax scrolling. I am agree with you, I was tired of ugly designs of Woothemes, all seems to be the same with a diferent name. I hope that this theme were beginning of new era of awesome themes here, and not to cancel my memership. Yes, this theme is different! Bravo. A much needed change, and for that I applaud Woo. But a photography theme this is not. It’s really more like a WooCommerce product theme with a full image homepage. I guess photographers who want to sell their prints can use it but most photographers want a portfolio site not an ecommerce site. And the navigation stuck in the top right corner that needs to click and expand even on a desktop to get between one category to another is a pain to actually use. Are all Woo themes from here on out going to be bent toward WooCommerce? Thanks James. It is desperately needed for WooThemes. I’m redoing my own portfolio site and could not use Canvas this time because the portfolio section is just too basic. For a photo theme to not have a photo portfolio module (or even a slideshow capability) makes it NOT a photography theme, and instead a WooCommerce product theme. I know that over 60% of Woo’s business is coming from WooCommerce, so I expect themes bent that direction. Just seems a bit misleading to call it a photography theme. You can easily add a slideshow using WooSlider. In reality Maximize is not just a “Photography theme” and we don’t want to pigeon hole it that way. Likewise it is not just a “WooCommerce product theme”. Like all of our themes It can be used for almost any purpose. However, we feel that the full screen homepage layout lends itself well to this niche which is why we decided to present it this way on launch. Remember, you don’t actually have to use the full screen homepage. A very cool theme but I have a question before buying it. On the shop-page (http://demo2.woothemes.com/maximize/shop/) there is this big white block with black letters stating ‘Shop’. Is it possible to remove this (easily) and bring the products up more? And on top (the breadcrumbs I suppose) where it says Maximize/Products is it possible to change this to Myname/Gallery? I am looking for a clean online gallery ecommerce template to be used with woocommerce so thanks for answering in advance. Yup there’s a filter for this in WooCommerce iirc. Yup, the first item is your site name and ‘Products’ I believe can be modified by filtering the WooFramework breadcrumb args. These two items however remain open. I am not able to change them. Can you give me a bit more information on how to tackle both? Yep, this is the way to go: innovative, original and still open to tweak around. Very nice job and congrats to James. An interesting theme, but I have a few questions. On first impression, full screen home pages always look great, but they often cause issues in practise – i.e. only landscape images work, not portrait, so this is often quite limiting for a photographer. How do you address this? I noticed that the responsiveness also changes the proportions of the image – i.e. the image can be stretched or squashed. Far from ideal for a photographer, but I guess this is how you’ve addressed my first point? Can this be controlled so the background image does not distort but changes scale proportionally? Is the home page have a widgetised area? What are the options? Or is that just with the Business template? And finally, with the navigation, are there any options to show the navigation along the top when viewing in a wide browser window? Hidden navigation on a large screen I think is an unnecessary additional click, so I think that would be a very useful option for many. Looking forward to hearing about the photography and portfolio extensions. They will be very useful if implemented well. I agree that a fullscreen page like the Maximize homepage does pose potential issues, but if you’re prepared to invest some time in getting it right it can work really well. We decided that making the images fit the browser window by default was the best catch-all solution for the majority of users. This could be overwritten with some custom CSS. Obviously portrait images aren’t going to work so well but again with some CSS you could tailor this to fit your needs. In iPhone portrait orientation for example we align the images centrally and crop the left and right edges of landscape images. The only widgetised area on the homepage is in the slide-out navigation. In our demo the ‘latest tweets’ widget has been added there to demo this but obviously you can add whatever you like there. I appreciate that the slide-out navigation on desktop orientation is not to everyones taste. I do however think we’re going to see more and more (particularly content driven) sites move in this direction. It’s a question of whether you’d rather guide users around your website or let them choose their own path. I guess it’s love/hate for now, but you can always add a secondary navigation to your sidebar containing the main navigation points. I am very happy with this theme, it is unlike anything I have used before! And sorry for the double, I got an error the first time. Very excited for this! Great to see some more progressive design coming from Woo. I do think the aspect ratio issue for homepage photography is a major one. Showcasing anything with human subjects, architecture or known forms & shapes is out of the question if the aspect ratio is not maintained. Please fix! I know there are good options out there for having the image fill a container without changing its aspect ratio. As I’ve already said in the comments here we felt this was the best solution to serve the majority of users. You can change this behaviour fairly easily with some CSS. I hear you… just making our voices heard as customers. I and a few others think this was a poor choice. Putting the responsibility on us to find & figure out the required CSS is not a positive customer (or photographer)-oriented solution. No worries! It’s your theme. I don’t have to buy, right? I agree, it looks like a pretty theme but there’s no way I would ever present my photography without a fixed aspect ratio. Saying it was the “best solution” … best for who? Considering this is a theme designed for photographers, Woothemes need to fix this asap (without us having to hack the CSS). Even cropping the image would be preferable to squashing our lovingly constructed photos. +1 for this. I logged a support request asking how to switch this off, but got the stock “contact codeable / tweaky / affiliated woo workers” reply. given that you reckon we can change this fairly easily with some custom CSS, and given that it’s being marketed as a photography theme and given that lots of photographers have flagged this issue, would it be too much to ask for a settings panel option in a future release please? I tried this new theme too in the demo and on desktop all is fine and very well designed. But as I demoed it on a touchscreen like iPhone and iPad, I found that on fullscreen page with a video shown, there is no way out from that page, because the whole page is clickable for starting the video. The arrows are to small either on iPad and iPhone too. There you have to work on. Hi James, as I mentioned playing videos from that page with a fullscreen video is no pain, but if you want to leave that page you go in trouble. Only using the main menu is a way or the sites logo rediredirecting to homepage again. If you show as seen in the demo five slides, four of them with photos and one with embedded video, it is best to put that video on last slide because of this, that leaving the slide with embedded video is a pain. Is there any timeline on when the photography sales plugin will be released? Hi, this theme looks like it will fit my needs very well, but the “WooCommerce photography extension” would be a key selling point for me. When will be be expecting this? Nice try. 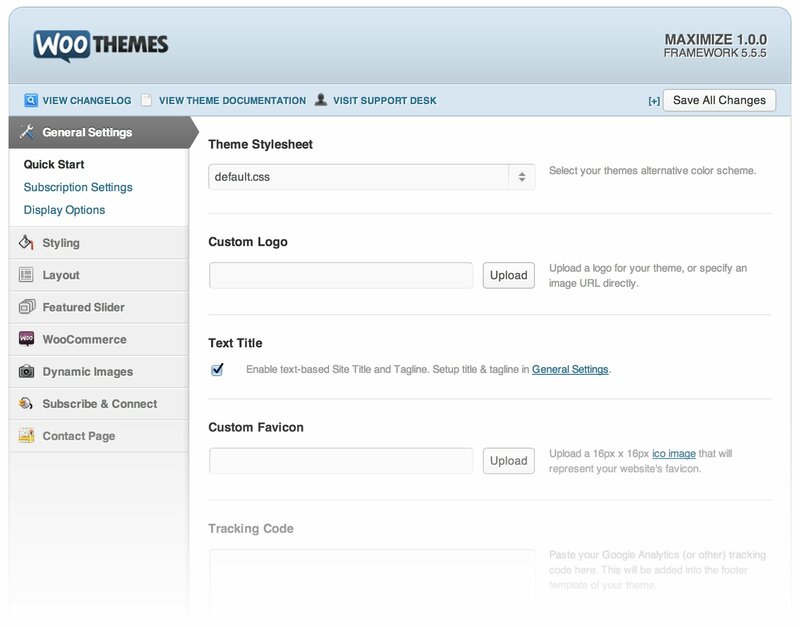 The images do stretch on http://demo2.woothemes.com/maximize/ – this makes this theme useless to be blunt. I would have expected something more professional from you because I am happy with the features of your previous themes. I also tried this new theme on desktop and I see that everything is fine and very well designed. I am very happy with this theme, it is unlike anything I have used before. This is an innovate theme, and I sê you have tried much. It is really awesome and what you shared above is really different yet clear and useful. Thanks a lot for sharing! A query when is the release date of the plugin to photograph? The Maximise demo appears to be broken in Internet Explorer 10 but OK in Chrome. Very intriguing. When will the WooCommerce Photography extension launch? I need this! 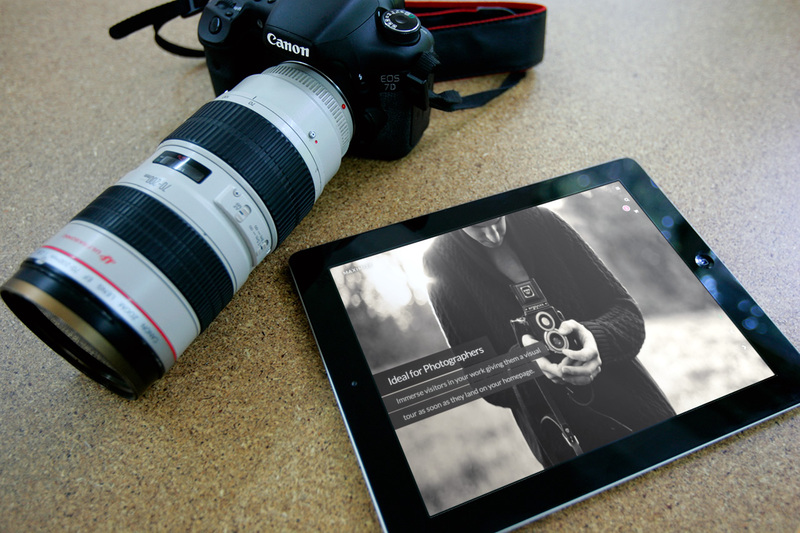 + 1 for the Photography extension – my customers need this! Any idea when it’s going to drop? Is there a beta version? same request. any coming out date for the extension? Same here, desperate for this! Haai wooGuys (and girls) When will this extension be released? You haven’t been awnsering for a month? I’ll add my voice to the “When is the extension coming out” question.